According to historic records, the world’s first cruise ship was launched on June 29, 1900. She went by the name of Prinzessin Victoria Luise and enjoyed a successful six years of service until being grounded off the coast of Jamaica. When you compare her modest 407.5 foot length to the today’s 1000 feet megaliners, such as Allure of the Seas, the differences are phenomenal! 2015 will mark almost 115 years of the cruising industry and it’s understandable to see how a plethora of myths have emerged over the past century. To help clear the air we’ve put together an expert write up which lifts the lid on 10 of the most widely believed cruise ship myths and replaces them with cold hard facts! Gone are the days of shabby furnishings and subpar service. Contemporary cruising is more luxurious than ever before and offers passengers unsurpassed style, elegance and comfort. MSC commissioned Italian architect and interior designer Giuseppe De Jorio to design its interior spaces while Norwegian Cruise Line hulls are graced by the artwork of prominent names such as David “LEBO” Le Batard and Guy Harvey. Today’s cruise ships also enjoy star studded naming ceremonies, with Princess Cruises’ Royal Princess christened by the Duchess of Cambridge herself and Royal Caribbean’s Quantum of the Seas launched by the legendary Kristin Chenoweth. The internet has emerged as an integral part of everyday life and many would-be sailors shy away from cruise holidays due to the belief that they’ll be forced to sign off for weeks on end. While this may have been the case a few years ago, vessels such as Quantum of the Seas are equipped with state-of-the-art satellite Wi-Fi systems which offer lighting fast connections. Passengers can also hit up on-board internet cafes for speed, convenience and cost effectiveness. While you could spend your days grazing at the buffet and lounging by the pool cruise ships are definitely not for lazy travelers. Today’s leading lines pepper their itineraries with an array of action packed shore excursions which allow passengers to stretch their legs and explore exciting new destinations. One of the most commonly held cruising misconceptions is the notion that all cabins are created equal. This couldn’t be further from the truth. When booking a cruise holiday it’s important to understand the various different cabin options and what they offer. Inside cabins don’t feature any windows and are generally the cheapest choice while suites boast extravagant features such as balconies, multi-level floor plans and even baby grand pianos. If you‘re under the impression that cruise cuisine is lackluster think again! The kitchens of today’s contemporary vessels are overseen by some of the biggest names in the business and serve up tantalizing dishes that wouldn’t look out of place in a five star restaurant. The Royal Caribbean fleet houses Jamie Oliver’s world famous Italian eateries, Celebrity Cruises diners enjoy a menu created by James Beard while P&O has secured the expertise of Luke Mangan, Marco Pierre White, Atul Kochhar and Olly Smith. While cruise ships do pull into popular tourist destinations you can also choose to set sail on an itinerary which takes passengers off the beaten track. Think Alaska, South East Asia, Africa and beyond. Smaller vessels are able to access smaller ports which makes boutique lines a great option for travelers wanting to escape the crowds. Cruising down rivers such as the Amazon, Mekong and Rhone is another fabulous way to ensure an unspoiled and intimate experience. Forget cheesy stage shows and over the top cabarets. Today’s leading lines offer passengers exceptional entertainment featuring world class talent. Norwegian showcases the iconic Blue Man Group, Royal Caribbean’s Oasis of the Seas hosts Andrew Lloyd Webber’s Tony Award-winning Broadway production of Cats while Disney Cruise Line puts on a daily schedule of magical shows that will have the whole family singing along. Despite popular belief cruising actually offers holiday makers incredible value for money. When compared to the cost of paying for accommodation, food, drinks, entertainment and transport even high end cruise lines are cheaper than planning an on-land getaway. When you hit up sites such as Cruise 1st you’ll also be able to snap up some fantastic deals which further slash the cost of cruising! Plenty of people worry that embarking on a cruise ship holiday will mean endless queues for everything from restaurants and bars to disembarkation and poolside lounges. Modern cruise ships have done everything they can to address such issues and ensure that passengers enjoy a seamless and spacious experience at all times. Think you’ll get sick of staring out to sea? Next generation cruise ships are packed full of cutting edge on-board facilities which are guaranteed to keep you entertained for weeks on end! When you sail with Royal Caribbean you’ll enjoy access to skydiving simulators, surf machines, rock climbing walls, bumper cars, ice skating rinks and more! Evening entertainment features world class Broadway style shows while sports venues, day spas, gyms and activities will have you rushing to squeeze everything into your schedule. What do you think now? Have we converted you? 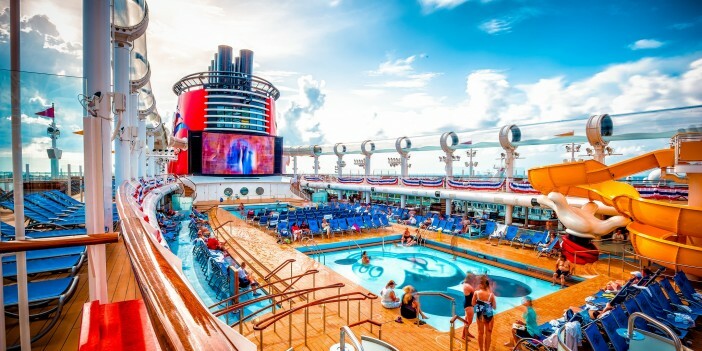 If you’d like to give cruising a try, we can help at Cruise 1st. You can find out-of-this-world cruises right here. And there are lots of options, so you’ll definitely find something that suits you. What are you waiting for?